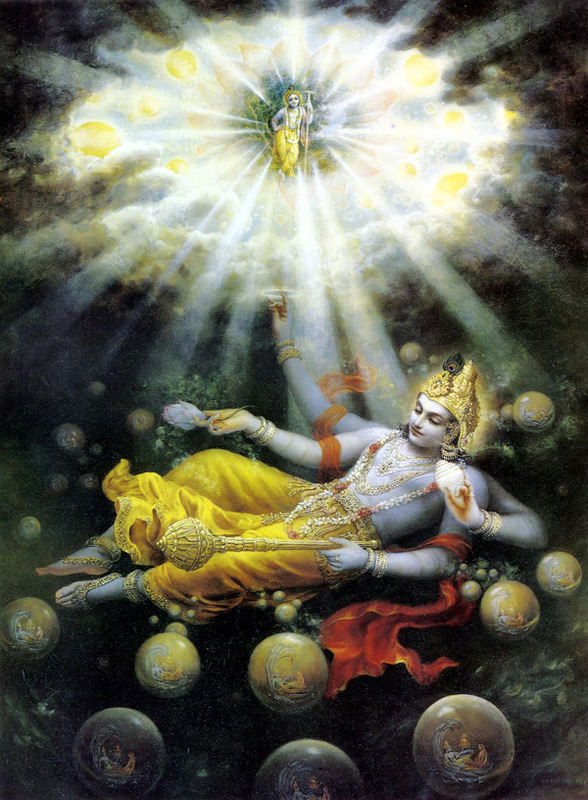 Lord Srikrishna asks Arjuna to take refuge in him, practicing Yoga. Thus he can be sure that without doubt he will be with the Lord. He further assures him that he is going to explain to Arjuna the truth behind Self Knowledge and its realization, knowing which there will be nothing unsaid or anything that Arjuna does not understand. Out of thousands of men, one may strive for perfection and among them maybe only one may know the Lord in truth. Such a person is rare and dear to the Lord. Besides the eight material energies (Earth, Fire, Water, Air, ether, mind, intellect and Ego) there is a spiritual energy of the Lord which sustains what the entire universe. There is nothing superior to him and all these exist like pearls in a thread around the Lord’s neck. Hear now what the Lord has to say: I’m the taste in water, the light in sun and moon, the sacred syllable ‘Om’ , the sound in ether and the ability in man. I’m also the fragrance of mother earth, the heat in fire, the life in all human beings and the discipline of the ascetics. Know me to be the eternal seed of all living beings, the wisdom of the wise and the power of the glorious. Of the strong, I’m the strength devoid of desire and passion and I’m the love that is virtuous Also know that all modes of being, of purity, passion and ignorance emanate from me, but I’m not in them. I’m above the modes of energy. Deluded by the senses, no one understands me in truth. Only those who have completely surrendered to me can overcome this delusion. The demoniac who live in illusion do not comprehend my nature. Among the pious there are four types of people who seek me: the distressed, the desirer of wealth, the inquisitive and the one who seeks knowledge about me. Of these the seekers of knowledge are dear to me as they live in me always. He is indeed dear, who renders devotional service to me. There are other believers who worship other demigods without understanding that it is me who they worship indirectly. I make their resolve firm and reward them as per their sincerity. I’m not revealed to the foolish who think that I’m invisible that has become embodied. I know the past, present and future of all, but no one knows me in entirety. All people are born into delusion and some pious souls are able to realize me. They serve me with determination and faith. Some of them who are worried about old age also offer their prayers to me. Such people are also dear to me. Those who know me in life also know me during their death also. And have no doubt – they come to me. More to come in a week’s time.